Citation Information: JCI Insight. 2019;4(2):e124061. https://doi.org/10.1172/jci.insight.124061. Sepsis-induced acute respiratory distress syndrome (ARDS) has high morbidity and mortality and arises after lung infection or infection at extrapulmonary sites. An aberrant host response to infection leads to disruption of the pulmonary alveolar-capillary barrier, resulting in lung injury characterized by hypoxemia, inflammation, and noncardiogenic pulmonary edema. Despite increased understanding of the molecular biology underlying sepsis-induced ARDS, there are no targeted pharmacologic therapies for this devastating condition. Here, we review the molecular underpinnings of sepsis-induced ARDS with a focus on relevant clinical and translational studies that point toward novel therapeutic strategies. Sepsis-induced ARDS arises from a lung infection (direct lung injury) or from an extrapulmonary source (indirect lung injury). 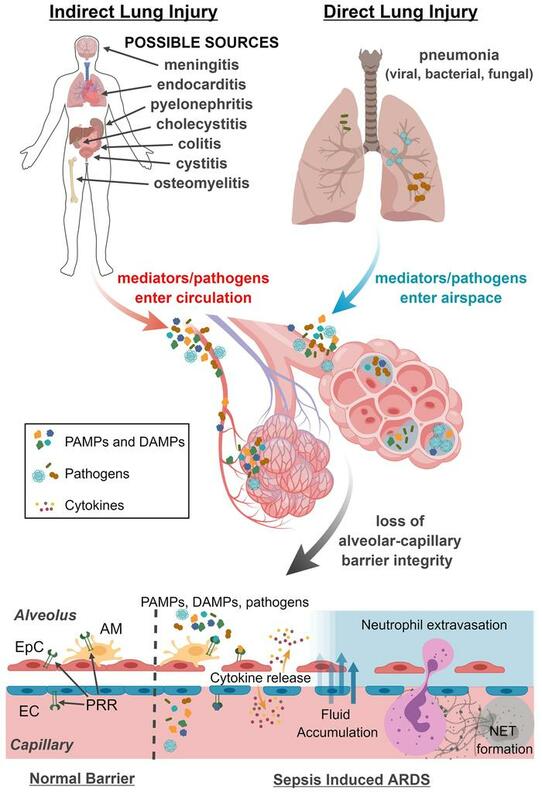 The host response to the pathogen results in recruitment of inflammatory cells, release of proinflammatory cytokines, and other pathways of injury (see text) that damage the alveolar-capillary barrier. Loss of integrity of this barrier leads to influx of pulmonary edema fluid and lung injury. AM: alveolar macrophage, DAMPs: damage-associated molecular patterns, EC: endothelial cell, EpC: epithelial cell, NET: neutrophil extracellular trap, PAMPs: pathogen-associated molecular patterns, PRR: pattern recognition receptor.